Mat Ricardo's London Varieties 2013 Season! 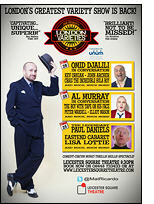 February 28th Omid Djalili, March 28th Al Murray, April 25th Paul Daniels. The first three shows for the 2013 season of Mat Ricardo's London Varieties have just been announced. This year they've moved to the Leicester Square Theatre but all the features and surprises you loved last year will be back... bigger and crazier too! Mat Ricardo writes: "Just last like year, the interview from each show will be podcast, but additionally, an edited version of the show will be professionally filmed and put online so you can watch it at home! For free! I figured if TV won't make a proper variety show, then I will! And, as you can see, we've got some big names. Some of them you'll know, and some of them maybe you won't, but every single person on all of the bills is the absolute best at what they do, and I'm proud and - frankly - stunned to be welcoming them to The Varieties. 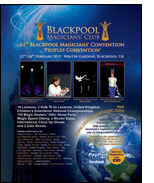 We've got some bona-fide legends and heroes of variety and circus coming your way this year.